A large, cowlike mammal with distinct hump in the shoulder region; head, neck, shoulders, and forelegs with long, shaggy hair; hind part of body with short hair; head heavy with short, curved, black horns; tail short and ending in tuft of hair; color brownish black anteriorly, brownish posteriorly. Dental formula: I 0/3, C 0/1, Pm 3/3, M 3/3 X 2 = 32. External measurements approach: (males) total length, 3,400 mm; tail, 610 mm; hind foot, 610 mm; height at shoulders, 1,800 mm; females somewhat smaller. Weight of bulls, 700-1,000 kg; females, 300-400 kg. Formerly widespread in the western two-thirds of Texas; now extirpated or confined in captivity. It is no longer considered a game animal in Texas. In early days the bison was found in great numbers over a vast range in North America. With the westward expansion of the white settlers, it became an object of exploitation on a tremendous scale that resulted in its total disappearance from the East and its almost complete extermination over much of its western range. By 1825 it had become practically extinct east of the Mississippi River. The building of the transcontinental railways after 1830 hastened the slaughter of the vast herds west of the river. In the 1870s hundreds of thousands were recklessly killed for their hides and tongues. In 1877-78 the last great slaughter of the "southern herd" took place south of the main transcontinental railroads. 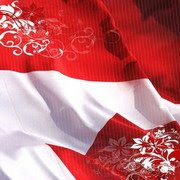 In the north their numbers likewise rapidly decreased. When protection of the buffalo was under consideration by the Texas Legislature, General Phil Sheridan opposed it, pointing out that the sooner the buffalo was eliminated the sooner the Indian would be starved into submission. Sure enough, before 1880 both the buffalo and the Indian had all but passed away. The big slaughter took place about 1877-78 when there were reported to be 1,500 hunting outfits working out of Fort Griffin (Shackelford County) alone. More than 100,000 hides were taken in the months of December and January of that winter. From 1881 to about 1891 there were shipments of buffalo bones from Texas totaling $3 million in value. In the late 1880s it was realized that the bison was approaching extinction. 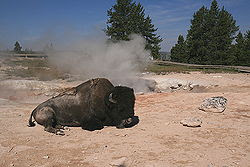 By then, there were left in the United States only a few privately owned herds and a herd in Y ellowstone National Park. 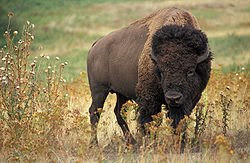 It was not until May of 1894 that an effective law for the preservation of the bison was passed by the United States Congress, and subsequently, the various herds were built up in the United States and Canada. 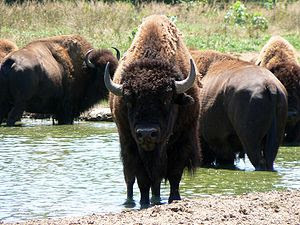 By 1933 the total population of bison in North America was estimated at 21,000, of which the greater part (17,000) were in Canada on the Buffalo National Park near Wainwright, Alberta. The bison of the western United States is normally a dweller of open prairies. The subspecies B. b. athabascae of Canada and the Old World relative (Bos bonasus), however, are forest animals. 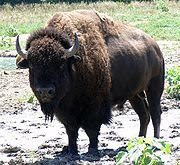 This, together with the fact that our plains bison lacks the keen eyesight of most plains dwellers but has a keen sense of smell, suggests that at some remote time in the past the plains bison, too, lived in woodland areas. Bison are gregarious creatures that live together in herds, except for the old bulls which, especially in spring and early summer, lead a more or less solitary existence. During the period of rut in July and August, and again in winter, the old bulls tend to be more tolerant of the herd. Normally, bison are unobtrusive but when angered or when called upon to protect their calves they are vicious and dangerous. As with domestic cattle, old bulls are surly and may attack with slight provocation, as will cows with calves. 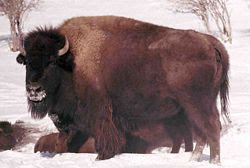 The daily activity of bison is much like that of domestic cattle. The chief feeding periods are early morning and late afternoon, with midday given over to cud-chewing, siesta, and wallowing. Normally, nighttime is a period of rest. Formerly, the plains bison migrated seasonally, going south as far as Florida and Texas in winter, and northward again in summer. Their normal gait is a plodding walk, which may break into a swinging trot or, when frightened or angered, a stiff-legged gallop. Plains bison are predominantly grazers, feeding chiefly on grasses and secondarily on forbs. Browse species contribute slightly to their menu. Because of this, competition between bison and domestic cattle for range forage is so great that we cannot afford, for economic reasons, the return of the bison to anything like its former numbers. The period of rut is July and August. The animals are promiscuous in mating habits but usually only the large, mature bulls do the breeding. Young and undersized bulls are driven from the herd to linger on the outskirts and await with anticipation the opportunity to participate whenever the herd bull is off guard. As with range cattle, a scale of social dominance is established with each bull next highest dominating those below him. 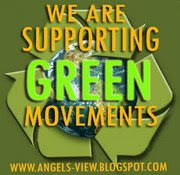 The period of gestation is 8½ - 9 months — the calves arriving in April, May, or early June. One calf at a time is the rule; twins are rare. The young one normally is weaned in late fall, but occasionally it continues to nurse until the arrival of the next calf. Sometimes cows breed only in alternate years. Sexual maturity is reached in the third year. According to Cahalane, cows have remained productive for 40 years indicating a life span of at least 45 years. At present, the plains bison has little economic importance. There is some demand for its flesh as food for man, but the temperament of the beast will not permit its wide replacement of cattle.